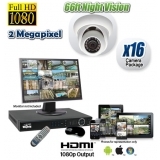 CCTV Camera World offers a variety of complete, easy to install 16 camera surveillance systems that include everything needed for total video surveillance. Our security camera systems feature the latest H.264 video compression technology and are designed to protect your home or business. 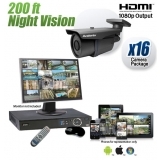 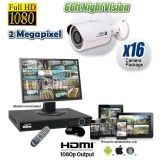 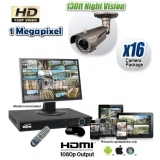 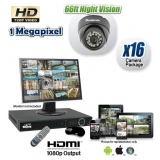 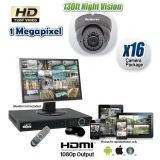 Our surveillance systems come pre-packaged in 16 camera kits, and can be configured to meet your exact security needs. 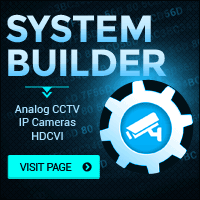 If you would like to use existing cameras from a previous system, you have the freedom to choose how many cameras you need, while keeping the 16 channel DVR as is. 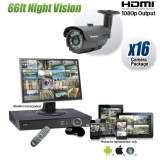 Compared to our competitors, ALL of our security camera systems are remotely viewable - that means you can easily monitor your home or business remotely via the internet. 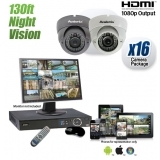 All of our video security systems come with a 30 day money back guarantee, a minimum one year warranty, and free technical support over the lifetime of your product.